Do you know how healthy your sales pipeline is right now? If not, it’s time to get to work. Sales pipeline management is crucial to the ongoing success of your sales process. Mastering your pipeline can help you unlock revenue, identify bottlenecks in your sales funnel, and accelerate your sales cycle. Get the most out of your sales pipeline. 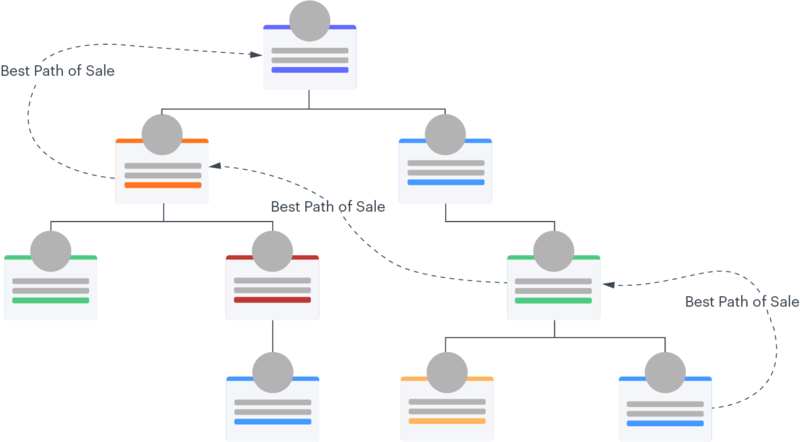 Link data from your CRM and other reports, visualize each rep’s next steps, and organize opportunities at each stage of the sales process with the Lucidchart Sales Solution. With a sales pipeline, sales reps can track the progress of each opportunity and identify where they should focus their attention for best ROI. A well-documented sales process with a visual pipeline helps reps and their managers create more accurate forecast reports and evaluate the health of their sales process effectively. Sales reps can use their pipeline to look at their KPIs like calls made, calls connected, appointments scheduled, etc. to gauge how well they’re performing against past metrics. Then they can focus on the actions or stages that need it most. For instance, if you need to schedule at least ten appointments each week to make your monthly quota, and your pipeline shows you’ve only scheduled seven so far that week, you know that you need to set at least three more to stay on track with your goals. By visually displaying your pipeline with specific, measurable actions, teams and individuals can track their performance at a glance and keep each opportunity moving through the pipeline, so prospects don’t get lost in the shuffle. It’s worth noting that while sales pipelines and sales funnels work together, they have distinct functions. Each tracks the flow of prospects through the sales process. However, where the sales pipeline visually follows the steps a rep has to take to move the prospect through each stage, a sales funnel visualizes the conversion rates of those prospects through each pipeline stage. Sales managers can use a sales funnel report to help forecast sales based on past deals. 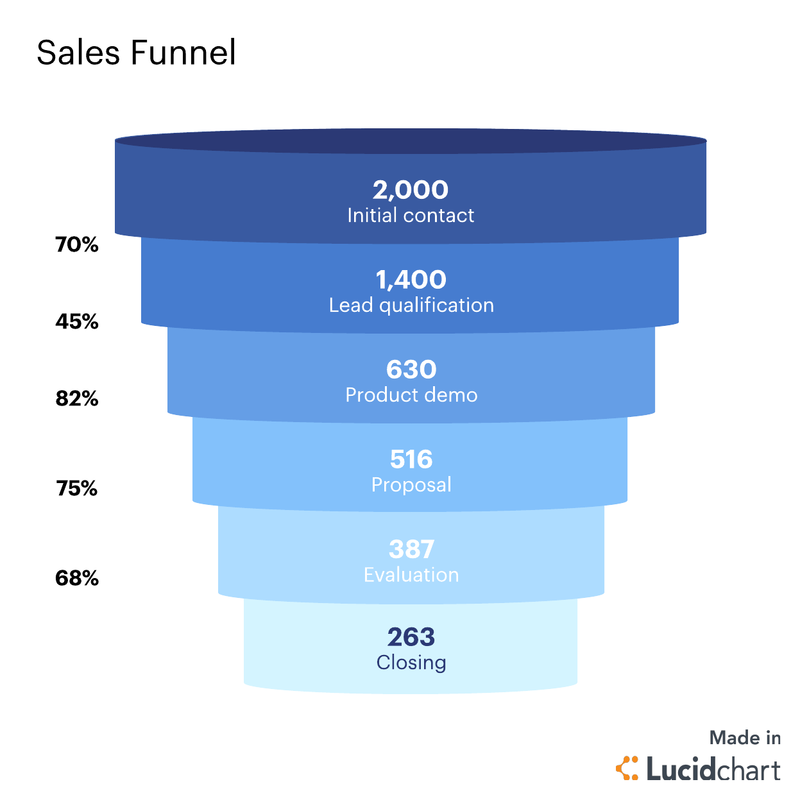 For instance, a sales funnel tracking opportunities from the previous quarter might show that out of 200 leads, 45 became closed-won deals, with a breakdown of how many progressed through each stage. With this information, managers can make forecasts based on how many current leads they have in their pipeline and identify where prospects are getting stuck in the funnel. They manage their pipeline more effectively by adjusting their process or prioritizing actions or stages that have been neglected. Sales pipeline management is a sales manager’s bread and butter. Perfecting your sales process and managing your pipeline through each stage leads to successful deals and increased ROI. Although an automated sales pipeline can do much of the heavy lifting for you, every sales manager should still follow these key best practices to ensure a healthy pipeline. Pipeline management is as much about what to do as it is what not to do. Make sure you avoid these costly mistakes to keep your sales pipeline looking fresh. We get it. Prospecting is hard, tedious work. But it’s important not to neglect your lead generation efforts. Following a regular prospecting process and schedule is key to maintaining a healthy sales pipeline. Without refilling your prospect bucket, your pipeline will shrink over time, and your opportunities will dry up. Review your sales pipeline regularly to identify leads that have dried up, including prospects who haven’t communicated in a while, opportunities that have been stuck in one stage for too long, or leads that won’t progress. Letting these opportunities sit in limbo hurts your numbers and skews your predictions. Keep your pipeline fresh by periodically sifting through your opportunities and weeding out those that have gone cold. Just remember to send them a final “break-up” email to confirm they are no longer interested or prepared to move forward. Depending on the circumstance, you may just need to shuffle them to an earlier stage or simply put the lead “on pause” with a note about the best time to contact again. Each opportunity is different, so make sure to communicate with your leads to find out what’s going on. That way you can make sure all the opportunities in your pipeline are actively progressing, so you aren’t wasting your time on dead ends. The best sales teams follow a standard sales process from prospecting to close. This should be no different for your follow-ups. Make sure you have a specific follow-up procedure to ensure you don’t let viable leads slip through the cracks. In fact, a study conducted by the Harvard Business Review found that sales reps who followed up within an hour of receiving a query were seven times more likely to qualify the lead. Your follow-up process should outline the timing, cadence, and contact method for each type of opportunity based on your sales cycle and specific buyer’s journey. No matter what your specific pipeline looks like, you should always follow these guidelines to be successful. As a sales manager, you can then use this data to calculate your sales goals and set realistic monthly quotas for your team. With those metrics input into your pipeline, each person can see their progress with each opportunity and stay on track to meet their goals. Weed out dead leads to ensure accurate forecasting. Move prospects back to earlier stages if circumstances change their progress. Check dates and timelines for accuracy. It’s tempting to keep dead leads to boost your numbers, but this is a temporary gain and can hurt your current and future sales goals. Once you’ve confirmed a lead is cold and won’t be continuing, purge it from your pipeline. This practice will free up time to focus on more promising prospects and ensure your forecasts are accurate. Additionally, evaluate your prospects. Sometimes you will have to move a prospect back a stage in the pipeline if circumstances change. For instance, if you got stakeholder buy-in initially, but there was a changing of the guard at the organization, you may need to repeat that step to ensure all parties are still ready to move forward. Although reevaluating your prospects is a step back, in the long run, it will help your deal to progress more efficiently to a successful close. Note: Account maps can also help you track key relationships and your best path to sale, so you and your leaders can better gauge where a deal stands. 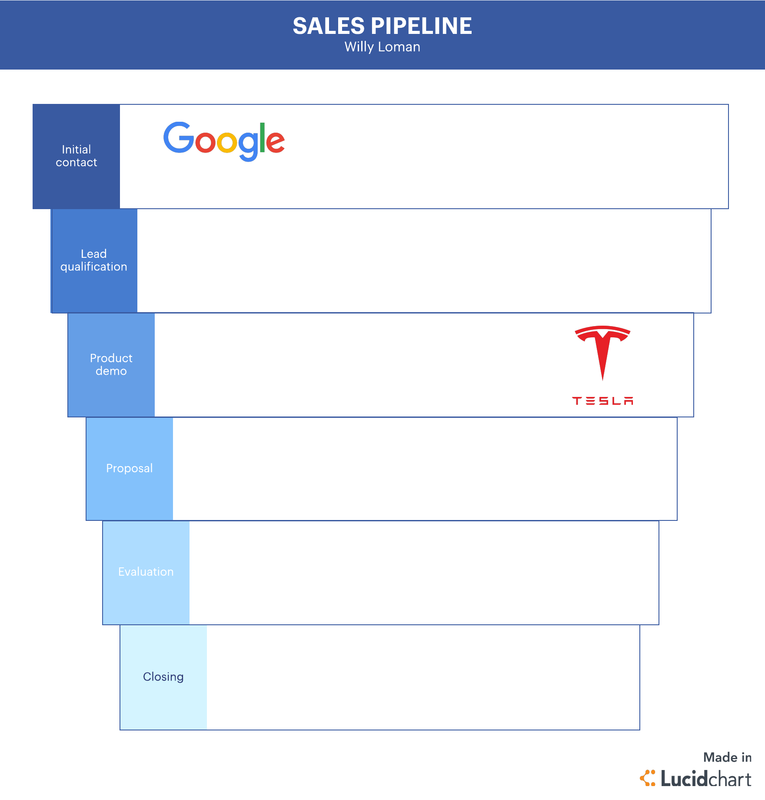 Lucidchart helps managers and their reps accelerate the sales cycle and drive more conversions through the Lucidchart Sales Solution. Lucidchart integrates with Salesforce (and many of your other favorite platforms) to visualize your data in one place. Data linking, customizable templates, and conditional formatting let you create your own sales pipeline and reports that are always up to date so you can make the best predictions and focus on the opportunities that matter most.